Home// Internet Marketing// How Does Google Determine Authority? Authority is one of the most important factors in getting your website to appear at the top of Google search results. Google strives to offer the best answers to its users’ queries, so it’s essential that they choose trustworthy and authoritative sites to appear at the top of search results. But how does Google determine authority? We’re often asked this question, and many marketers want simple answers, like the number of backlinks, the quality of their information, or the number of shares any one page has on social media. Unfortunately, it isn’t that straightforward, and there are many factors that play into how Google determines your site’s authority. But on this page, we’ll take a look into the criteria they use and offer some tips on how you can make your website more authoritative. If you'd like to speak with a professional, you can reach us at 888-601-5359. WebFX can help you increase your authority with the strategies we mention below. First of all, why does authority matter? Your site’s authority in Google’s eyes affects how well you’re able to rank in search engine results. They want to provide reliable information and results to their users, meaning that the more authoritative you are, the more customers you can earn from organic search. If Google doesn’t think your website is authoritative, you’ll rarely make it to the top of SERPs for any of your target keywords. This will make it difficult to attract potential customers to your site. As a result, your site’s authority has a direct impact on your ability to reach customers online. This means that improving your reputation and building trust with search engines should be major factors in your SEO strategy. How does Google determine the authority of a website? How Google determines the authority of a website has been a long-standing debate. Authority, in the world of search engines, all comes down to how much credibility your website has established online. This doesn’t just mean that Google picks and chooses which sites to call credible, though. 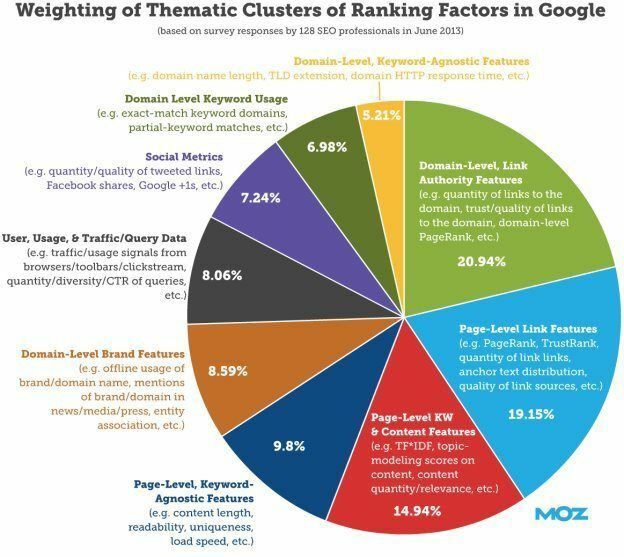 According to this chart from Moz, 21% of Google’s ranking algorithm depends on “link authority features,” or the number of links to a domain and the quality of those links, and 19% depends on the page-level link features, or the quantity of links to a specific page. Essentially, the most significant factor in your site’s authority is quality and quantity of links it has from other sites. Many marketers believe that their site’s authority is impacted by how trustworthy their visitors think it is. And while it’s certainly valuable to have a site that users trust, their perception is unrelated to Google’s rating of your authority. Authority is determined by search engines and is essentially how much weight they give to any given site. A website will only be able to reach users if it’s authoritative enough to rank well, and authority is what makes that happen. Trust, on the other hand, is determined by individual users and refers to how much users can personally rely on a website’s information. Though user trust is important to your website, it doesn’t directly impact your rankings. How many links your website has. If your website has a lot of links from other credible and authoritative sites, search engines can determine that your website is also authoritative. How established your site is. Typically, the older the website, the higher its authority. This example is from Open Site Explorer by Moz. Your reputation. If you’ve been in business for a long period of time and have a positive reputation, users will trust the information on your site. Your testimonials. Lots of positive testimonials prove that that your business creates happy customers. Your posts. Lots of quality content shows that your business is an authority in your industry. Your reliability. How much visitors can rely on your website for quality, accurate information. There is no shortcut to making your site authoritative. It doesn’t happen overnight, and it will take at least a few months to achieve the results you want. But there are a few things you can do that will help your website to climb the ladder to high authority. As we mentioned above, links are by far the most important factor in determining authority. There are a few ways you can build them from quality sites. There are many successful tactics you can utilize to build valuable links to your site. Though it doesn’t happen overnight and takes some work, authoritative link building is crucial to your sites authority. The first is by fostering relationships with leaders in your industry. When you reach out to bloggers, news editors, and other influential people within your industry, you can offer to write original articles or submit other content like infographics or research. If they publish that content on their sites, they’ll link back to your company as the source – and your authority will increase. Publish quality content: Quality content shows your visitors and other influencers in your field that you have an authoritative website. It shows that you know what you’re doing in your field, and that you can be trusted. There is more to quality content than just having accurate information, though. Your content should also be unique to your site and provide visitors with new insight. Google’s job is to provide the best answers possible for its users. Part of providing the best answers is to shed new light on a topic and not give users the same tired information they have already heard. The key to creating quality content is focusing on topics that relate to your area of expertise. Not only will you know the background of the topic, but users will be confident that you’re providing them with correct information. You should also use as much detail as possible if you want your content to be considered quality. Longform content can help you achieve increased traffic, page views, and rankings, so it’s worth your time to go into as much detail as possible on topics you’re an authority on. A good portion of the content you create should be on “evergreen” topics, or topics that will stay relevant for years to come. Though there is nothing wrong with writing a piece of content on the newest feature of your business that is only current for the time being, but evergreen content is much more likely to attract visitors for years – instead of just a month or two. Manual Outreach: Finding websites that would benefit from content you just published could be a great opportunity to build a link. Email the author of the page and let them know that they just published an article, blog, or infographic that they might be interested. Attach the link and wait for a reply! When you’re outreaching, you also should be sure to personalize your pitch. Make the recipient feel like you have known them for a while, and know what their company is all about. The important thing about manual outreach is that you don’t come across as annoying. Put your information out there, but don’t be overly pushy with your content. If you have a site that is hard to navigate, it is difficult for Google to deem it authoritative because it doesn’t provide a great user experience. You should utilize a straightforward navigation bar and a sitemap to help your users get around your website easily. Another factor in the user experience is page load speed, and it should be at the forefront of your website goals. Internet users live in a world where most of their requests are instantaneous. If your pages take more than 2 seconds to load, you should work on improving your speed to ensure that users don’t bounce from your page. Since it would be nearly impossible to explain every topic on your website extensively, it’s important to link to other credible sites that users can click to get more information. A moderate number of links can help lead users to other resources that might help them. However, if you use too many links, it can make your copy hard to read. You should avoid linking to another site if you have another page internally on your own website that you could link to, and also avoid linking to the same place twice on one web page. Make sure you link to credible sites though, because the websites you link to can also affect your authority. When you link to a page, you are saying that they have some great information on the topic you are covering. If you are linking to a low authority site, the fact that you are vouching for that information might be questionable to search engines like Google. Like many marketers, you might think that the more pages on your website are shared on social media, the more Google would see your site as authoritative. However, this isn’t exactly the case. Matt Cutts, a part of Google’s web spam team, says that the main reason social media isn’t used as a ranking factor is because there is no possible way that Google could crawl every tweet or Facebook post. Using this incomplete data could skew rankings – and Google certainly doesn’t want that. This means that social media isn’t a major factor in your authority. But it can still help you reach your other authority-related goals. You can use social media to build relationships with high-profile leaders in your industry. You can later utilize these relationships to build links – which do have a direct impact on your authority. Social media is also a great place to increase brand awareness and credibility. So by making connections with leaders in the industry and promoting your brand, you can slowly bring in high authority sites to link to your site. How long does it take to improve your site’s authority? As we mentioned before, it is impossible to boost your website’s authority overnight. After looking at the criteria that determine your site’s authority, you can get a sense of how long it takes to build your website’s authority. Building relationships with high-profile leaders can take time, especially the kinds of valuable relationships your need to earn links from their sites. It also takes time to prove that you provide trustworthy and accurate information that is worth it to link to. High authority sites don’t hand out links without careful thought and consideration, and you should be prepared to invest a serious amount of time reaching out to editors and bloggers before any of them are willing to link to your site. How can you earn back lost authority? There are certain signals that can have a negative impact on your site’s authority and therefore damage its ability to rank highly in SERPs. If your rankings have recently fallen, this may be the explanation – but thankfully, it’s highly unlikely that you’ve destroyed your site’s authority to the point of no return. If your site authority takes a dip, there are ways that you can earn back your previous rankings. You should first start by removing any bad links that lead to 404 error pages. Remember, the pages you link to are ones that you believe have useful information, and if you’re linking to a broken page, that doesn’t say much about how carefully you choose your sources. Make sure that all of your outbound links are high authority websites that provide your visitors with valuable information. Another factor that can damage – and potentially destroy – your ability to rank is a Google penalty. Follow these steps to fix the issue, and you should be able to restore your lost rankings. Are you ready to increase your website’s authority? If you’d like to take your website’s authority to the next level, WebFX has all the tools necessary to propel you to a higher DA. Contact us today to speak with a strategist about how our team can help you build your site’s authority and improve your rankings in search engines like Google.